Great, gentle product. We use this for my daughter's dance competitions. Love love love this!! takes a couple times to get used to but you are able to apply it instantly saving time from having to wait for regular glue like the duo glue to get tacky before applying. This really didn't work for me. I love the brush and how easy it is to glide on, but the glue just didn't stick! -Even after I held it down for a few seconds, it just never got tacky enough to take hold. I had to use another glue that was included in another set of lashes (Katy Perry's Eyelure lashes) to do the trick. I absolutely love this product! 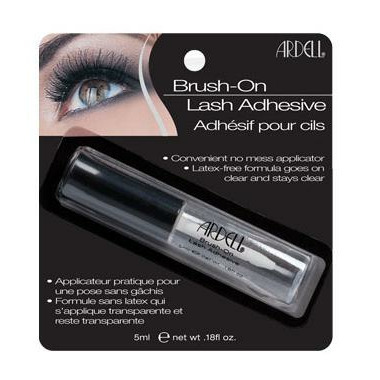 This is my go to eyelash glue. The fact that it's brush on makes it so much easier, you can easily control how much glue gets put on, it doesn't make the glue too thick. I will recommend this product to everyone. Good product for occasional use. Dries clear, holds well. Very poor performing. Does not hold. Dries very brittle and flakes off in eye. Got in eye and it caused severe burning and reaction. Most surprising because it is latex free, and my usual brand, [Maybelline Latex Free] works like a charm but cost twice as much, and now I know why. This is a case of you get what you pay for. In my opinion, do not waste your money on this one. Good price and no messy glue spills and easy to use!